Blue Ceramic Mug: Can you see what I see? No, of course you can't, because I'm a terrible blogger, and although I take pictures for the blog all the time, I rarely take the enormous amount of time and effort it takes to get them off my camera (say it with me: five-year-old laptop). I have pictures of the mittens (still minus one thumb - I got distracted by pretty mohair). I have pictures of the psychadelic BSJ-in-progress, I have pictures of all kinds of stuff. But none of it makes it to the blog. Would you (the two people who read my blog) like me to add them after-the-fact in the posts they belong to? Or would you like me to just divebomb a new post with a lot of photos? 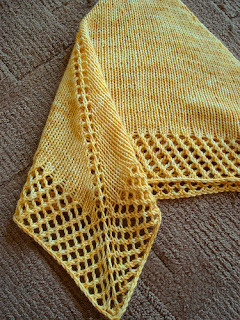 This is the Chastain Park Shawl designed by the very talented L. Mariana. 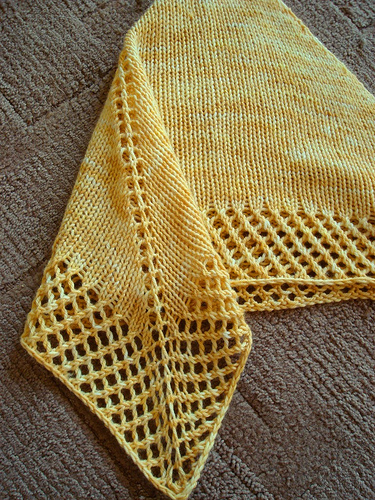 She has some very lovely patterns available, and this one seemed the perfect simple pattern to showcase this complex and gorgeous yarn. There's just one hitch. The shawl calls for about 200 yards (thereabouts) of DK weight yarn. 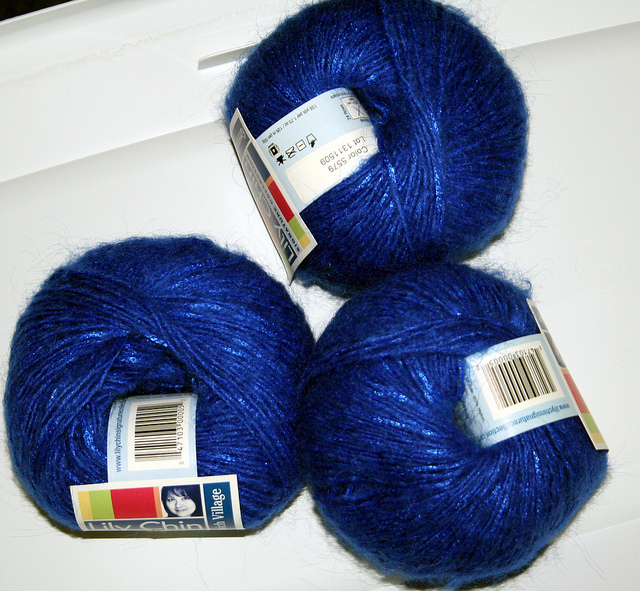 I have 414 yards of the blue lovely. Solution? Knit two of them ;) One will be a gift for an undisclosed recipient (who may or may not be one of the two people who actually reads this blog, I'm not sure). The other one I'm undecided about. I may make one bigger than the other, I may make them slightly different, I just don't know. I am modifying the shawl pattern slightly, according to the pattern notes I saw on someone's Ravelry project page (after a bunch of stockinette, do six rows of the open lacework, then ten rows of stockinette, lather, rinse, repeat). It's turning out SO beautiful that the second one might just stay with me. I did so well with South Beach this weekend, I was insanely proud of myself. Then it all fell apart at dinner last night. Sundays are somewhat of a command performance at my parents' house. The children and I are expected to troop to my mother's house for dinner each Sunday, barring special circumstances - for instance, I worked a lot of Sunday evenings at the store just before Christmas. This is a family tradition. 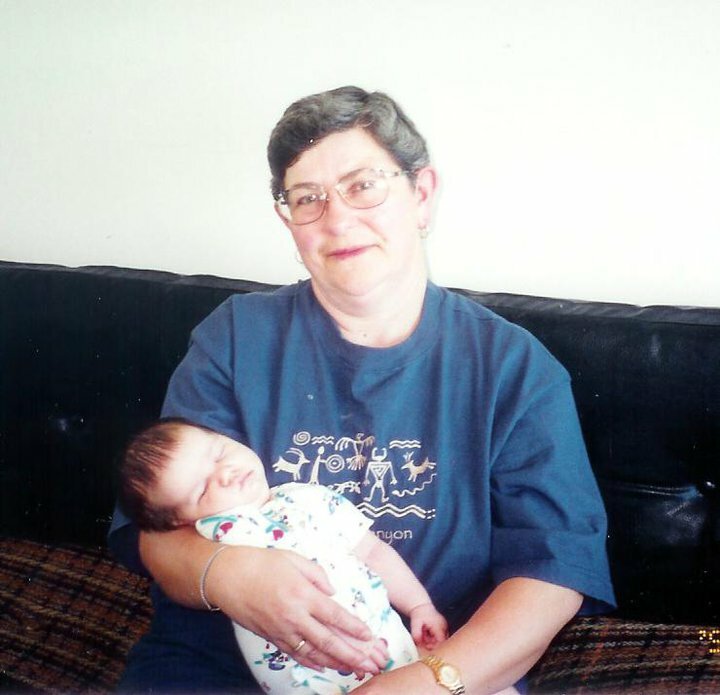 My mother (usually... sometimes my dad came too) used to bring me to my grandma's house every Sunday. I don't remember going as often after my brother was born, but my grandfather passing away and my brother being born happened in the same month (I'm not fond of March, 1980 for some reason) and we may have simply stopped going as often after that. Anyway, as Rob says, to make a long story insufferably longer (there, see how I quote you in the blog?)... Sunday's dinner was chicken pot pie and corn, with about fifty different things for dessert afterward. I had pot pie, I had corn. I was virtuous and refused ice cream, but then ate 1/4 of an ENORMOUS red velvet cupcake. *sob* I am ashamed. The carbs really do set off cravings though, because this morning, I hoovered the raw vegetables I had brought for lunch, two plain chicken breasts, a bottle of diet coke and a bottle of crystal light before I managed to slow down and take stock. Bleh. Going to have to walk across campus a couple of times tonight to counteract that binge, even if it was healthy food. Gotta get my act together if I don't want to be the one paying up in Biggest Loser at work this Friday (the person who loses the least, or gains the most, has to pay $5 to the pot at the end of the week). That, and I have to beat 275 this week. 12 1/2 year old pic of my mom and my nearly 13-year-old. I think that you should dive bomb a new post. If you go back and posthumously insert photos, I'll never find them. I like the Biggest Loser idea and carbs do set off a bad chain reaction. I was doing great and then...bombed. Good luck! Great site, too!